The researchers of University of Exeter Medical School, and found that pimavanserin significantly improves psychosis symptoms in patients of Alzheimer’s disease. The drug is without any significant side effects and is more beneficial in patients with the most severe psychotic symptoms.In other words Pimavanserin is new drug that controls symptoms of Alzheimer’s disease psychosis.The study has been published today in Lancet Neurology. Up to half of the 45 million people worldwide who are living with Alzheimer’s disease will experience psychotic episodes, a figure that is even higher in some other forms of dementia. 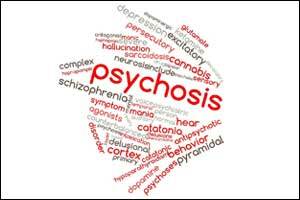 Psychosis is linked to a faster deterioration in dementia. Currently there is no approved safe and effective treatment for these distressing symptoms. In people with dementia, widely-used antipsychotics lead to sedation, falls and can double the speed at which brain function deteriorates. Their use increases risk of falls, and leads to 1,660 unnecessary strokes and 1,800 unnecessary deaths in the UK every year. Despite all of these negative effects they have very little benefit in improving psychosis in people with dementia Pimavanserin works differently to other antipsychotics, by blocking a very specific nerve receptor (THT2A) in the brain. Now, it has been found to effectively reduce symptoms of psychosis in people with Alzheimer’s disease without the damaging effects of other antipsychotics. Clive Ballard, Professor of Age-Related Diseases at the University of Exeter Medical School, who led the research, said: “Psychosis is a particularly terrifying symptom of Alzheimer’s disease. People may experience paranoia, or see, hear or smell things that are not there. It’s distressing both for those experiencing the delusions and for their carers. “It’s particularly encouraging that most benefit was seen in those with the most severe psychotic symptom, as this group is most likely to be prescribed antipsychotics. We are talking about vulnerable elderly, frail people who are suffering terrifying symptoms, being sedated with current antipsychotics even though its well known that they cause terrible health issues and even death in people with dementia, and have very little benefit. We urgently need to do better by them, and our encouraging results provides hope. We’re delighted that our results have led to a larger phase 3 clinical trial which is now ongoing.” The findings are the result of a double-blind, placebo-controlled exploratory trial designed to evaluate the efficacy and safety of pimavanserin in 181 patients with Alzheimer’s disease psychosis, with 90 of them given pimavanserin and 90 of them on a placebo. Its safety and efficacy in reducing psychotic symptoms in dementia is now being assessed in a larger-scale clinical trial in the US. The results build on previous research that found pimavanserin was effective for people with dementia related to Parkinson’s disease. Pimavanserin has been approved for use by the Food and Drug Administration (FDA) in the US for this purpose, but has not yet been submitted for approval to the European equivalent, the European Medicines Agency. Previously, the Alzheimer’s Society said it is “imperative” that it goes through European approval processes for Parkinson’s Disease Dementia. Pimavanserin is currently the subject of a Phase III trial In the US to assess its safety in a wider group, and to see if it can prevent relapse of psychotic symptoms in some of the most common forms of dementia.